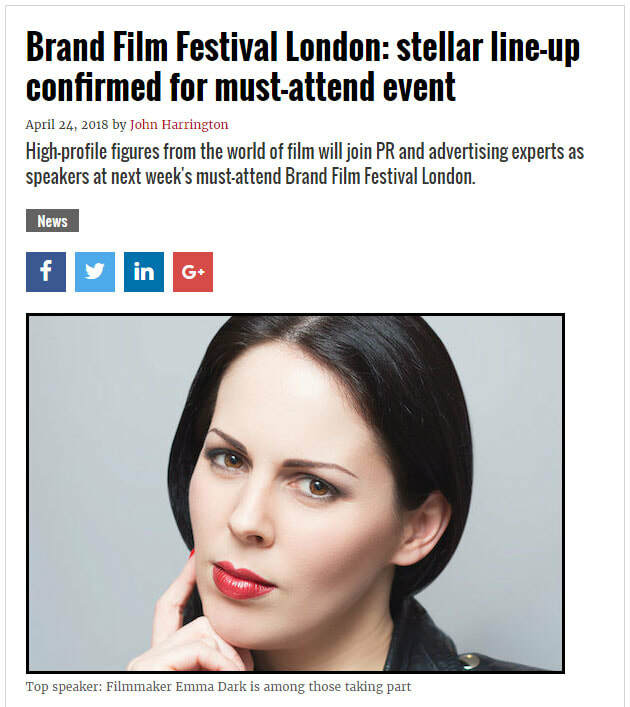 High-profile figures from the world of film will join PR and advertising experts as speakers at next week's must-attend Brand Film Festival London, 2nd May. Top speaker: Filmmaker Emma Dark is among those taking part. Despite the rise in female influencers and the attention brought to life during the International Women’s Day, there is still a significant lack of females within the film industry. Recent statistics show that there is only 1 female director per every 22 men in Hollywood - so what are we going to do about it? Hear the stories of 3 independent UK female filmmakers on how they’re breaking through the male dominated industry and setting an example for women in the industry. Filmmakers Emma Dark, Kate Shenton and Anna Mimi Jayson will speak about female leaders in the film industry. 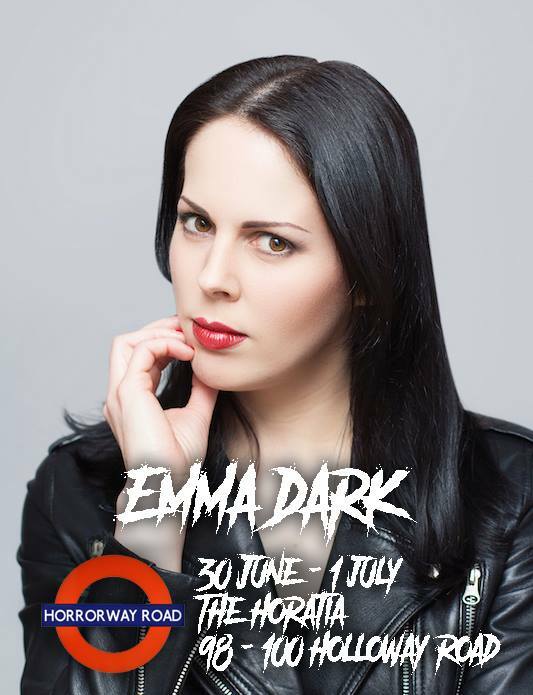 Emma will be attending as a guest at Horrorway Road hosted by Alleycat Graphics 30th June and 1st July. Other guests include: Graham Humphreys (poster artist "The Evil Dead" and "A Nightmare on Elm Street"). Emma will be attending as a guest at London Horror Con 1st and 2nd September. (Blood Drive, Falling Skies, X-Files), Tony Moran (Michael Myers - Unmasked), Tyler Mane, Darren Kent, Hugh Ross (Nightbreed) and More! 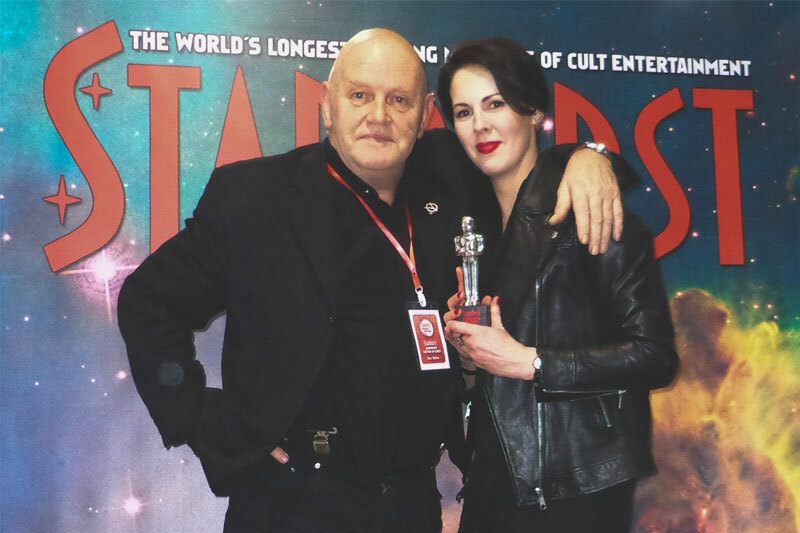 Emma's last appearances were at The Film Fair Saturday 9th June 2018, Huddersfield Haunting Sunday 22nd October 2017, and Stevenage ODP Autograph Show 20th May 2017. 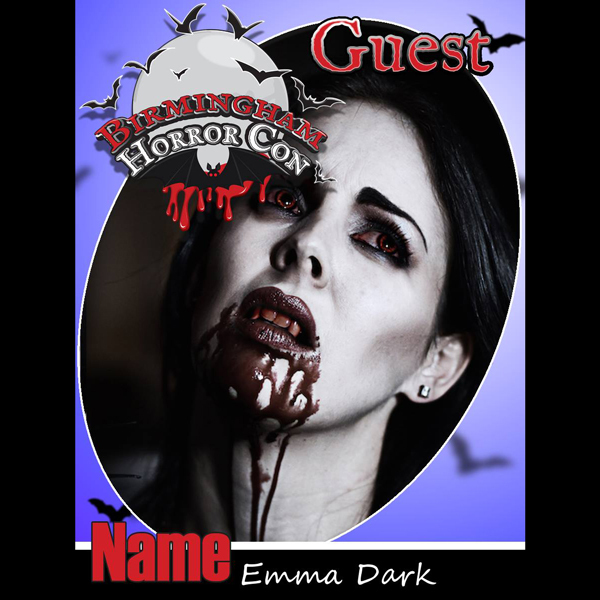 Emma appeared as a special guest at Birmingham Horror Con on Saturday the 4th February 2016. Other guests included Jsu Garcia Star of Nightmare on Elm Street part 1, and Ken Sagoes star of Nightmare on Elm Street parts 3 and 4. 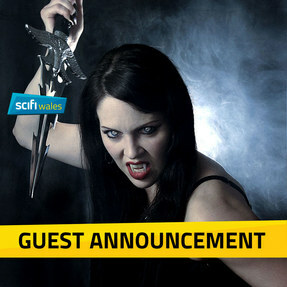 Emma appeared as a special guest at Scifi Wales on Saturday 3rd September 2016. Other guests included Star Wars actors Ted Western and Alan Harris and Game of Thrones Ross O'Hennessy. Emma appeared as a special guest at Bristol Horror Con on Saturday the 15th October 2016. Other guests included Laurence R. Harvey and Lee Nicholas Harris (The Human Centipede 2). Quadrophenia's Perry Benson and other well known Film and TV guests. 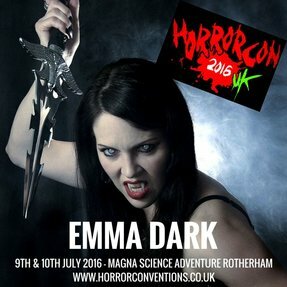 HorrorCon UK ran 9-10 July 2016 and featured Emma as a horror guest. Other guests included Kane Hodder, Doug Bradley, Graham Masterton, David Naughton, Linnea Quigley, Shaun Hutson and many more! Dale-Con comic con ran 18-19 June 2016 and featured Emma as a horror guest. Other guests included Sam J. Jones and Melody Anderson (Flash Gordon) and UK horror author Matt Shaw and many more! 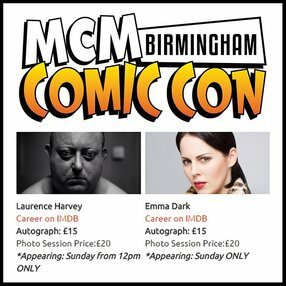 Emma appeared at MCM Birmingham Sunday 20th March as a special guest. Other guests included Laurence R. Harvey (The Human Centipede 2 & 3), Judy Matheson (Twins of Evil), and many more! Emma appeared at Doncaster's Digi-Con Sunday 21st February 2016 as a special guest. Other guests included WWE wrestling star Gangrel and The Railway Carriage's Dean Sills. SLIME HOUSE TV: HorrorConUK 2016 Ep-01 - Emma Dark Interview, Kane Hodder & More! 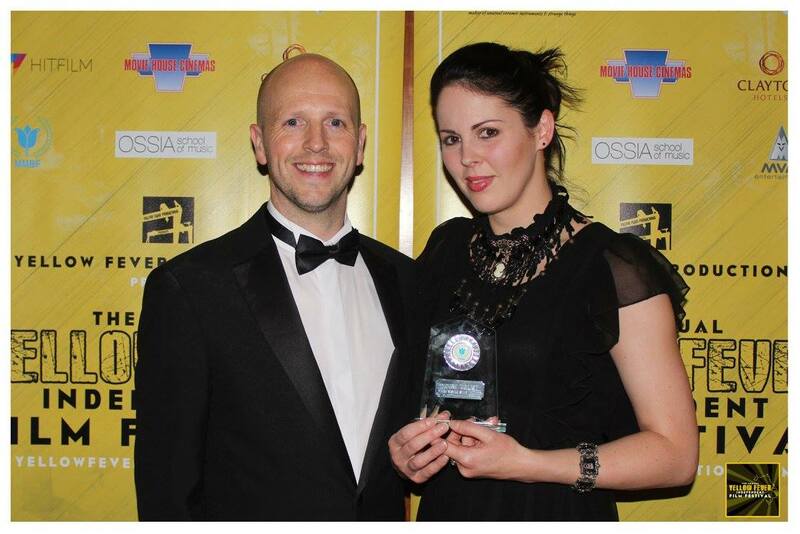 UK HORROR SCENE: Emma Dark enters 'The Room' to join the UKHS crew for a chat about her short film Seize the Night. Discussing sequels, singing, fangs and make-up. What more could a horror film lover want? Enjoy! IN THE PROCESS: Emma talks about her new horror/sci-fi/action short film Seize the Night and her experiences as a filmmaker. THE FAN CARPET: Emma talks about women in film to The Fan Carpet at Women in Horror Month's 'United in Blood' event, run by Jonathan Hughes, at the Whirled Cinema in London. THE FAN CARPET: Talking about the ups and downs of filmmaking and future projects. RADIO OF HORROR: Dr. Chris interviews Emma about Seize the Night, Island of the Blind Dead, her inspirations and more! MR SHELTON: John Shelton interviews Emma about Seize the Night while guesting/signing at the Camden Film Fair! ​United States 34212, United Kingdom 373, France 114, Australia 105, Germany 66, Netherlands 57, Romania 38, Sweden 29, Norway 2. THE FAN CARPET: Marc Jason Ali speaks to Emma Dark and cast/crew about Seize the Night. Paul & Stewart visit Horrorcon UK 2016 at the Magna Science Centre in Sheffield on 10th July 2016. They interview actress and presenter Emily Booth, speak to the team from the indie horror film "Welcome to Welloak", and actress and director Emma Dark about her short horror film "Seize the Night".